This tallit set features beautifully chain-stitched hand embroidery on raw cotton, using various colors of silk. Hand embroidered by the famous Yair Emanuel artists. The set includes a matching kippah and a tallit bag. 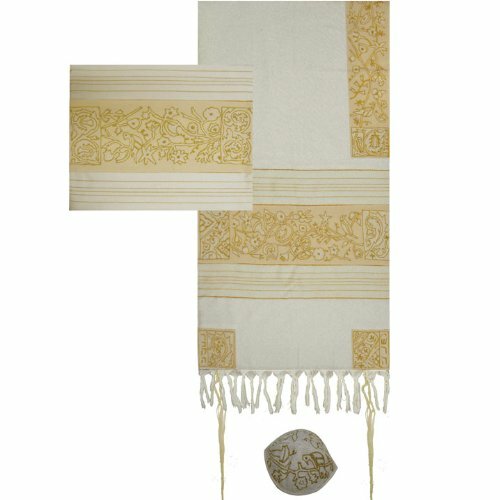 A magnificent hand embroidered tallit - fit for that special occasion! Set includes: Tallit, matching Tallit Bag and Kippah; pre tied standard white tzitzis strings & matching neckband. This specific size is a prayer shawl (around the neck), perfect for a bar / bat Mitzvah kid! If you have any questions about this product by Yair Emanuel, contact us by completing and submitting the form below. If you are looking for a specif part number, please include it with your message. Red and Cream Large Wool Shawl Flowers Hand-Cut Kani Warm Pashmina Throw 80"x40"